This article is about the structure. For the card game, see Contract bridge. For other uses, see Bridge (disambiguation) and Bridges (disambiguation). A bridge is a structure built to span a physical obstacle, such as a body of water, valley, or road, without closing the way underneath. It is constructed for the purpose of providing passage over the obstacle, usually something that can be detrimental to cross otherwise. There are many different designs that each serve a particular purpose and apply to different situations. Designs of bridges vary depending on the function of the bridge, the nature of the terrain where the bridge is constructed and anchored, the material used to make it, and the funds available to build it. Most likely the earliest bridges were fallen trees and stepping stones, while Neolithic people built boardwalk bridges across marshland. The Arkadiko Bridge dating from the 13th century BC, in the Peloponnese, in southern Greece is one of the oldest arch bridges still in existence and use. The Oxford English Dictionary traces the origin of the word bridge to an Old English word brycg, of the same meaning. The word can be traced directly back to Proto-Indo-European *bʰrēw-. The word for the card game of the same name has a different origin. Before the rise of humanity, ants have been making bridges by using their own to allow others to cross. The simplest type of a bridge is stepping stones, so this may have been one of the earliest types. Neolithic people also built a form of boardwalk across marshes, of which the Sweet Track and the Post Track, are examples from England that are around 6000 years old. Undoubtedly ancient peoples would also have used log bridges; that is a timber bridge that fall naturally or are intentionally felled or placed across streams. Some of the first man-made bridges with significant span were probably intentionally felled trees. Among the oldest timber bridges is the Holzbrücke Rapperswil-Hurden crossing upper Lake Zürich in Switzerland; the prehistoric timber piles discovered to the west of the Seedamm date back to 1523 BC. The first wooden footbridge led across Lake Zürich, followed by several reconstructions at least until the late 2nd century AD, when the Roman Empire built a 6-metre-wide (20 ft) wooden bridge. Between 1358 and 1360, Rudolf IV, Duke of Austria, built a 'new' wooden bridge across the lake that has been used to 1878 – measuring approximately 1,450 metres (4,760 ft) in length and 4 metres (13 ft) wide. On April 6, 2001, the reconstructed wooden footbridge was opened, being the longest wooden bridge in Switzerland. The Arkadiko Bridge is one of four Mycenaean corbel arch bridges part of a former network of roads, designed to accommodate chariots, between the fort of Tiryns and town of Epidauros in the Peloponnese, in southern Greece. Dating to the Greek Bronze Age (13th century BC), it is one of the oldest arch bridges still in existence and use. Several intact arched stone bridges from the Hellenistic era can be found in the Peloponnese. The greatest bridge builders of antiquity were the ancient Romans. The Romans built arch bridges and aqueducts that could stand in conditions that would damage or destroy earlier designs. Some stand today. An example is the Alcántara Bridge, built over the river Tagus, in Spain. The Romans also used cement, which reduced the variation of strength found in natural stone. One type of cement, called pozzolana, consisted of water, lime, sand, and volcanic rock. Brick and mortar bridges were built after the Roman era, as the technology for cement was lost (then later rediscovered). In India, the Arthashastra treatise by Kautilya mentions the construction of dams and bridges. A Mauryan bridge near Girnar was surveyed by James Princep. The bridge was swept away during a flood, and later repaired by Puspagupta, the chief architect of emperor Chandragupta I. The use of stronger bridges using plaited bamboo and iron chain was visible in India by about the 4th century. A number of bridges, both for military and commercial purposes, were constructed by the Mughal administration in India. Although large Chinese bridges of wooden construction existed at the time of the Warring States period, the oldest surviving stone bridge in China is the Zhaozhou Bridge, built from 595 to 605 AD during the Sui dynasty. This bridge is also historically significant as it is the world's oldest open-spandrel stone segmental arch bridge. European segmental arch bridges date back to at least the Alconétar Bridge (approximately 2nd century AD), while the enormous Roman era Trajan's Bridge (105 AD) featured open-spandrel segmental arches in wooden construction. Rope bridges, a simple type of suspension bridge, were used by the Inca civilization in the Andes mountains of South America, just prior to European colonization in the 16th century. During the 18th century there were many innovations in the design of timber bridges by Hans Ulrich Grubenmann, Johannes Grubenmann, and others. The first book on bridge engineering was written by Hubert Gautier in 1716. A major breakthrough in bridge technology came with the erection of the Iron Bridge in Shropshire, England in 1779. It used cast iron for the first time as arches to cross the river Severn. 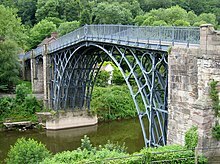 With the Industrial Revolution in the 19th century, truss systems of wrought iron were developed for larger bridges, but iron does not have the tensile strength to support large loads. With the advent of steel, which has a high tensile strength, much larger bridges were built, many using the ideas of Gustave Eiffel. In Canada and the U.S., numerous timber Covered bridges were built in the late 1700s to the late 1800s, reminiscent of earlier designs in Germany and Switzerland. (Some covered bridges were also built in Asia.) In later years, some were partly made of stone or metal but the trusses were usually still made of wood; in the US, there were three styles of trusses, the Queen Post, the Burr Arch and the Town Lattice. Hundreds of these structures still stand in North America. They were brought to the attention of the general public in the 1990s by the novel, movie, and play The Bridges of Madison County. In 1927 welding pioneer Stefan Bryła designed the first welded road bridge in the world, the Maurzyce Bridge which was later built across the river Słudwia at Maurzyce near Łowicz, Poland in 1929. In 1995, the American Welding Society presented the Historic Welded Structure Award for the bridge to Poland. Bridges can be categorized in several different ways. Common categories include the type of structural elements used, by what they carry, whether they are fixed or movable, and by the materials used. Bridges may be classified by how the actions of tension, compression, bending, torsion and shear are distributed through their structure. Most bridges will employ all of these to some degree, but only a few will predominate. The separation of forces and moments may be quite clear. In a suspension or cable-stayed bridge, the elements in tension are distinct in shape and placement. In other cases the forces may be distributed among a large number of members, as in a truss. Beam bridges are horizontal beams supported at each end by substructure units and can be either simply supported when the beams only connect across a single span, or continuous when the beams are connected across two or more spans. When there are multiple spans, the intermediate supports are known as piers. The earliest beam bridges were simple logs that sat across streams and similar simple structures. In modern times, beam bridges can range from small, wooden beams to large, steel boxes. The vertical force on the bridge becomes a shear and flexural load on the beam which is transferred down its length to the substructures on either side They are typically made of steel, concrete or wood. Girder bridges and plate girder bridges, usually made from steel, are types of beam bridges. Box girder bridges, made from steel, concrete, or both, are also beam bridges. Beam bridge spans rarely exceed 250 feet (76 m) long, as the flexural stresses increase proportional to the square of the length (and deflection increases proportional to the 4th power of the length). However, the main span of the Rio–Niteroi Bridge, a box girder bridge, is 300 metres (980 ft). The world's longest beam bridge is Lake Pontchartrain Causeway in southern Louisiana in the United States, at 23.83 miles (38.35 km), with individual spans of 56 feet (17 m). Beam bridges are the simplest and oldest type of bridge in use today, and are a popular type. A truss bridge is a bridge whose load-bearing superstructure is composed of a truss. This truss is a structure of connected elements forming triangular units. The connected elements (typically straight) may be stressed from tension, compression, or sometimes both in response to dynamic loads. Truss bridges are one of the oldest types of modern bridges. The basic types of truss bridges shown in this article have simple designs which could be easily analyzed by nineteenth and early twentieth century engineers. A truss bridge is economical to construct owing to its efficient use of materials. Cantilever bridges are built using cantilevers—horizontal beams supported on only one end. Most cantilever bridges use a pair of continuous spans that extend from opposite sides of the supporting piers to meet at the center of the obstacle the bridge crosses. Cantilever bridges are constructed using much the same materials and techniques as beam bridges. The difference comes in the action of the forces through the bridge. Some cantilever bridges also have a smaller beam connecting the two cantilevers, for extra strength. The largest cantilever bridge is the 549-metre (1,801 ft) Quebec Bridge in Quebec, Canada. Arch bridges have abutments at each end. The weight of the bridge is thrust into the abutments at either side. The earliest known arch bridges were built by the Greeks, and include the Arkadiko Bridge. With the span of 220 metres (720 ft), the Solkan Bridge over the Soča River at Solkan in Slovenia is the second-largest stone bridge in the world and the longest railroad stone bridge. It was completed in 1905. Its arch, which was constructed from over 5,000 tonnes (4,900 long tons; 5,500 short tons) of stone blocks in just 18 days, is the second-largest stone arch in the world, surpassed only by the Friedensbrücke (Syratalviadukt) in Plauen, and the largest railroad stone arch. The arch of the Friedensbrücke, which was built in the same year, has the span of 90 m (295 ft) and crosses the valley of the Syrabach River. The difference between the two is that the Solkan Bridge was built from stone blocks, whereas the Friedensbrücke was built from a mixture of crushed stone and cement mortar. The world's largest arch bridge is the Chaotianmen Bridge over the Yangtze River with a length of 1,741 m (5,712 ft) and a span of 552 m (1,811 ft). The bridge was opened April 29, 2009, in Chongqing, China. Tied arch bridges have an arch-shaped superstructure, but differ from conventional arch bridges. Instead of transferring the weight of the bridge and traffic loads into thrust forces into the abutments, the ends of the arches are restrained by tension in the bottom chord of the structure. They are also called bowstring arches. Suspension bridges are suspended from cables. The earliest suspension bridges were made of ropes or vines covered with pieces of bamboo. In modern bridges, the cables hang from towers that are attached to caissons or cofferdams. The caissons or cofferdams are implanted deep into the bed of the lake, river or sea. Sub-types include the simple suspension bridge, the stressed ribbon bridge, the underspanned suspension bridge, the suspended-deck suspension bridge, and the self-anchored suspension bridge. There is also what is sometimes called a "semi-suspension" bridge, of which the Ferry Bridge in Burton-upon-Trent is the only one of its kind in Europe. The longest suspension bridge in the world is the 3,909 m (12,825 ft) Akashi Kaikyō Bridge in Japan. Cable-stayed bridges, like suspension bridges, are held up by cables. However, in a cable-stayed bridge, less cable is required and the towers holding the cables are proportionately higher. The first known cable-stayed bridge was designed in 1784 by C. T. (or C. J.) Löscher. The longest cable-stayed bridge since 2012 is the 1,104 m (3,622 ft) Russky Bridge in Vladivostok, Russia. Some Engineers sub-divide 'beam' bridges into slab, beam-and-slab and box girder on the basis of their cross-section. A slab can be solid or voided (though this is no longer favored for inspectability reasons) while beam-and-slab consists of concrete or steel girders connected by a concrete slab. A box-girder cross-section consists of a single-cell or multi-cellular box. 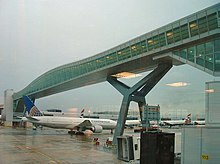 In recent years, integral bridge construction has also become popular. "Fixed link" redirects here. For other uses, see Intercontinental and transoceanic fixed links and Link (disambiguation). Moving a Bloomingdale Trail bridge from Ashland to Western in Chicago. Most bridges are fixed bridges, meaning they have no moving parts and stay in one place until they fail or are demolished. Temporary bridges, such as Bailey bridges, are designed to be assembled, and taken apart, transported to a different site, and re-used. They are important in military engineering, and are also used to carry traffic while an old bridge is being rebuilt. Movable bridges are designed to move out of the way of boats or other kinds of traffic, which would otherwise be too tall to fit. These are generally electrically powered. The double-decked George Washington Bridge, connecting New York City to Bergen County, New Jersey, US, is the world's busiest bridge, carrying 102 million vehicles annually. Double-decked (or double-decker) bridges have two levels, such as the George Washington Bridge, connecting New York City to Bergen County, New Jersey, US, as the world's busiest bridge, carrying 102 million vehicles annually; truss work between the roadway levels provided stiffness to the roadways and reduced movement of the upper level when the lower level was installed three decades after the upper level. The Tsing Ma Bridge and Kap Shui Mun Bridge in Hong Kong have six lanes on their upper decks, and on their lower decks there are two lanes and a pair of tracks for MTR metro trains. Some double-decked bridges only use one level for street traffic; the Washington Avenue Bridge in Minneapolis reserves its lower level for automobile and light rail traffic and its upper level for pedestrian and bicycle traffic (predominantly students at the University of Minnesota). Likewise, in Toronto, the Prince Edward Viaduct has five lanes of motor traffic, bicycle lanes, and sidewalks on its upper deck; and a pair of tracks for the Bloor–Danforth subway line on its lower deck. The western span of the San Francisco–Oakland Bay Bridge also has two levels. Robert Stephenson's High Level Bridge across the River Tyne in Newcastle upon Tyne, completed in 1849, is an early example of a double-decked bridge. The upper level carries a railway, and the lower level is used for road traffic. Other examples include Britannia Bridge over the Menai Strait and Craigavon Bridge in Derry, Northern Ireland. The Oresund Bridge between Copenhagen and Malmö consists of a four-lane highway on the upper level and a pair of railway tracks at the lower level. Tower Bridge in London is different example of a double-decked bridge, with the central section consisting of a low-level bascule span and a high-level footbridge. A viaduct is made up of multiple bridges connected into one longer structure. The longest and some of the highest bridges are viaducts, such as the Lake Pontchartrain Causeway and Millau Viaduct. A multi-way bridge has three or more separate spans which meet near the center of the bridge. Multi-way bridges with only three spans appear as a "T" or "Y" when viewed from above. Multi-way bridges bridges are extremely rare. The Tridge, Margaret Bridge, and Zanesville Y-Bridge are examples. A bridge can be categorized by what it is designed to carry, such as trains, pedestrian or road traffic (road bridge), a pipeline or waterway for water transport or barge traffic. An aqueduct is a bridge that carries water, resembling a viaduct, which is a bridge that connects points of equal height. A road-rail bridge carries both road and rail traffic. Overway is a term for a bridge that separates incompatible intersecting traffic, especially road and rail. A bridge can carry overhead power lines as does the Storstrøm Bridge. Some bridges accommodate other purposes, such as the tower of Nový Most Bridge in Bratislava, which features a restaurant, or a bridge-restaurant which is a bridge built to serve as a restaurant. Other suspension bridge towers carry transmission antennas. Conservationists use wildlife overpasses to stop habitat fragmentation and animal-vehicle collisions. The first animal bridges sprung up in France in the 1950s, and these types of bridges are now used worldwide to protect both large and small wildlife. Bridges are subject to unplanned uses as well. The areas underneath some bridges have become makeshift shelters and homes to homeless people, and the undertimbers of bridges all around the world are spots of prevalent graffiti. Some bridges attract people attempting suicide, and become known as suicide bridges. The Iron Bridge completed in 1781 was the first cast iron bridge. The materials used to build the structure are also used to categorize bridges. Until the end of the 18th century, bridges were made out of timber, stone and masonry. Modern bridges are currently built in concrete, steel, fiber reinforced polymers (FRP), stainless steel or combinations of those materials. Living bridges have been constructed of live plants such as Ficus elastica tree roots in India and wisteria vines in Japan. Cantilever For small footbridges, the cantilevers may be simple beams; however, large cantilever bridges designed to handle road or rail traffic use trusses built from structural steel, or box girders built from prestressed concrete. Suspension The cables are usually made of steel cables galvanised with zinc, along with most of the bridge, but some bridges are still made with steel-reinforced concrete. Arch Stone, brick and other such materials that are strong in compression and somewhat so in shear. Beam Beam bridges can use pre-stressed concrete, an inexpensive building material, which is then embedded with rebar. The resulting bridge can resist both compression and tension forces. Truss The triangular pieces of truss bridges are manufactured from straight and steel bars, according to the truss bridge designs. Unlike buildings whose design is led by architects, bridges are usually designed by engineers. This follows from the importance of the engineering requirements; namely spanning the obstacle and having the durability to survive, with minimal maintenance, in an aggressive outdoor environment. Bridges are first analysed; the bending moment and shear force distributions are calculated due to the applied loads. For this, the finite element method is the most popular. The analysis can be one, two or three-dimensional. For the majority of bridges, a 2-dimensional plate model (often with stiffening beams) is sufficient or an upstand finite element model. On completion of the analysis, the bridge is designed to resist the applied bending moments and shear forces, i.e., section sizes are selected with sufficient capacity to resist the stresses. Many bridges are made of prestressed concrete which has good durability properties, either by pre-tensioning of beams prior to installation or post-tensioning on site. In most countries, bridges, like other structures, are designed according to Load and Resistance Factor Design (LRFD) principles. In simple terms, this means that the load is factored up by a factor greater than unity, while the resistance or capacity of the structure is factored down, by a factor less than unity. The effect of the factored load (stress, bending moment, etc.) should be less than the factored resistance to that effect. Both of these factors allow for uncertainty and are greater when the uncertainty is greater. Most bridges are utilitarian in appearance, but in some cases, the appearance of the bridge can have great importance. Often, this is the case with a large bridge that serves as an entrance to a city, or crosses over a main harbor entrance. These are sometimes known as signature bridges. Designers of bridges in parks and along parkways often place more importance to aesthetics, as well. Examples include the stone-faced bridges along the Taconic State Parkway in New York. To create a beautiful image, some bridges are built much taller than necessary. This type, often found in east-Asian style gardens, is called a Moon bridge, evoking a rising full moon. Other garden bridges may cross only a dry bed of stream washed pebbles, intended only to convey an impression of a stream. Often in palaces a bridge will be built over an artificial waterway as symbolic of a passage to an important place or state of mind. A set of five bridges cross a sinuous waterway in an important courtyard of the Forbidden City in Beijing, China. The central bridge was reserved exclusively for the use of the Emperor, Empress, and their attendants. Bridge maintenance consisting of a combination of structural health monitoring and testing. This is regulated in country-specific engineer standards and includes e.g. an ongoing monitoring every three to six months, a simple test or inspection every two to three years and a major inspection every six to ten years. In Europe, the cost of maintenance is considerable and is higher in some countries than spending on new bridges. The lifetime of welded steel bridges can be significantly extended by aftertreatment of the weld transitions . This results in a potential high benefit, using existing bridges far beyond the planned lifetime. While the response of a bridge to the applied loading is well understood, the applied traffic loading itself is still the subject of research. This is a statistical problem as loading is highly variable, particularly for road bridges. Load Effects in bridges (stresses, bending moments, etc.) are designed for using the principles of Load and Resistance Factor Design. Before factoring to allow for uncertainty, the load effect is generally considered to be the maximum characteristic value in a specified return period. For example, in Europe, it is the maximum value expected in 1000 years. Bridge standards generally include a load model, deemed to represent the characteristic maximum load to be expected in the return period. In the past, these load models were agreed by standard drafting committees of experts but today, this situation is changing. It is now possible to measure the components of bridge traffic load, i.e., to weigh trucks, using weigh-in-motion (WIM) technologies. With extensive WIM databases, it is possible to calculate the maximum expected load effect in the specified return period. This is an active area of research, addressing issues of opposing direction lanes, side-by-side (same direction) lanes, traffic growth, permit/non-permit vehicles and long-span bridges (see below). Rather than repeat this complex process every time a bridge is to be designed, standards authorities specify simplified notional load models, e.g. HL-93, intended to give the same load effects as the characteristic maximum values. The Eurocode is an example of a standard for bridge traffic loading that was developed in this way. Traffic on Forth Road Bridge, Scotland before it was closed to general traffic. Traffic has now been moved to the Queensferry Crossing, that can be seen on the left. Most bridge standards are only applicable for short and medium spans - for example, the Eurocode is only applicable for loaded lengths up to 200 m. Longer spans are dealt with on a case by case basis. It is generally accepted that the intensity of load reduces as span increases because the probability of many trucks being closely spaced and extremely heavy reduces as the number of trucks involved increases. It is also generally assumed that short spans are governed by a small number of trucks traveling at high speed, with an allowance for dynamics. Longer spans on the other hand, are governed by congested traffic and no allowance for dynamics is needed. Calculating the loading due to congested traffic remains a challenge as there is a paucity of data on inter-vehicle gaps, both within-lane and inter-lane, in congested conditions. Weigh-in-Motion (WIM) systems provide data on inter-vehicle gaps but only operate well in free flowing traffic conditions. Some authors have used cameras to measure gaps and vehicle lengths in jammed situations and have inferred weights from lengths using WIM data. Others have used microsimulation to generate typical clusters of vehicles on the bridge. Bridges vibrate under load and this contributes, to a greater or lesser extent, to the stresses. Vibration and dynamics are generally more significant for slender structures such as pedestrian bridges and long-span road or rail bridges. One of the most famous examples is the Tacoma Narrows Bridge that collapsed shortly after being constructed due to excessive vibration. More recently, the Millenium Bridge in London vibrated excessively under pedestrian loading and was closed and retrofitted with a system of dampers. For smaller bridges, dynamics is not catastrophic but can contribute an added amplification to the stresses due to static effects. For example, the Eurocode for bridge loading specifies amplifications of between 10% and 70%, depending on the span, the number of traffic lanes and the type of stress (bending moment or shear force). There have been many studies of the dynamic interaction between vehicles and bridges during vehicle crossing events. Fryba did pioneering work on the interaction of a moving load and an Euler-Bernoulli beam. With increased computing power, vehicle-bridge interaction (VBI) models have become ever more sophisticated. The concern is that one of the many natural frequencies associated with the vehicle will resonate with the bridge first natural frequency. The vehicle-related frequencies include body bounce and axle hop but there are also pseudo-frequencies associated with the vehicle's speed of crossing and there are many frequencies associated with the surface profile. Given the wide variety of heavy vehicles on road bridges, a statistical approach has been suggested, with VBI analyses carried out for many statically extreme loading events. The failure of bridges is of special concern for structural engineers in trying to learn lessons vital to bridge design, construction and maintenance. The failure of bridges first assumed national interest during the Victorian era when many new designs were being built, often using new materials. In the United States, the National Bridge Inventory tracks the structural evaluations of all bridges, including designations such as "structurally deficient" and "functionally obsolete". There are several methods used to monitor the condition of large structures like bridges. Many long-span bridges are now routinely monitored with a range of sensors. Many types of sensors are used, including strain transducers, accelerometers, tiltmeters, and GPS. Accelerometers have the advantage that they are inertial, i.e., they do not require a reference point to measure from. This is often a problem for distance or deflection measurement, especially if the bridge is over water. An option for structural-integrity monitoring is "non-contact monitoring", which uses the Doppler effect (Doppler shift). A laser beam from a Laser Doppler Vibrometer is directed at the point of interest, and the vibration amplitude and frequency are extracted from the Doppler shift of the laser beam frequency due to the motion of the surface. The advantage of this method is that the setup time for the equipment is faster and, unlike an accelerometer, this makes measurements possible on multiple structures in as short a time as possible. Additionally, this method can measure specific points on a bridge that might be difficult to access. However, vibrometers are relatively expensive and have the disadvantage that a reference point is needed to measure from. Snapshots in time of the external condition of a bridge can be recorded using Lidar to aid bridge inspection. This can provide measurement of the bridge geometry (to facilitate the building of a computer model) but the accuracy is generally insufficient to measure bridge deflections under load. While larger modern bridges are routinely monitored electronically, smaller bridges are generally inspected visually by trained inspectors. There is considerable research interest in the challenge of smaller bridges as they are often remote and do not have electrical power on site. Possible solutions are the installation of sensors on a specialist inspection vehicle and the use of its measurements as it drives over the bridge to infer information about the bridge condition. These vehicles can be equipped with accelerometers, gyrometers, Laser Doppler Vibrometers and some even have the capability to apply a resonant force to the road surface in order to dynamically excite the bridge at its resonant frequency. ^ Fowler (1925). The Concise Oxford Dictionary. Oxford University Press. p. 102. ^ Brunning, Richard (February 2001). "The Somerset Levels". Current Archaeology. XV (4) (172 (Special issue on Wetlands)): 139–143. ^ National Parks Conference, Department of the Interior (1915). Proceedings of the National parks conference held at Berkeley, California March 11, 12, and 13, 1915. Washington, DC: Government Printing Office. p. 60. Retrieved March 14, 2010. (A log bridge) is a bridge composed of log beams, the logs being in natural condition or hewn, which are thrown across two abutments, and over which traffic may pass. ^ Bennett, David (2000). "The history and development of bridges". In Ryall, M.J.; Parke, G.A.R. ; Harding, J.E. (eds.). The manual of bridge engineering (Google books). London: Thomas Telford. p. 1. ISBN 978-0-7277-2774-9. Retrieved March 14, 2010. ^ Kutz, Myer (2011). Handbook of Transportation Engineering, Volume II: Applications and Technologies, Second Edition. McGraw-Hill Professional. ISBN 978-0-07-161477-1. ^ DeLony, Eric (1996). "Context for World Heritage Bridges". Icomos.org. Archived from the original on February 21, 2005. ^ "History of Bridges". Historyworld.net. Archived from the original on January 6, 2012. Retrieved January 4, 2012. 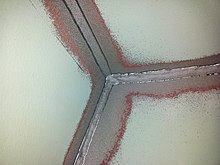 ^ "Lessons from Roman Cement and Concrete". Pubs.asce.org. Archived from the original on February 10, 2005. Retrieved January 4, 2012. ^ Dikshitar, V.R.R. Dikshitar (1993). The Mauryan Polity, Motilal Banarsidass, p. 332 ISBN 81-208-1023-6. ^ a b Dutt, Romesh Chunder (2000). A History of Civilisation in Ancient India: Vol II, Routledge, p. 46, ISBN 0-415-23188-4. ^ "suspension bridge" in Encyclopædia Britannica (2008). 2008 Encyclopædia Britannica, Inc.
^ Nath, R. (1982). History of Mughal Architecture, Abhinav Publications, p. 213, ISBN 81-7017-159-8. ^ "Iron Bridge". Engineering Timelines. Engineering Timelines. Archived from the original on March 4, 2016. Retrieved November 18, 2016. ^ "Historic Wooden Bridges/"Covered Bridges"". HSNB.DE. July 11, 2011. Retrieved October 15, 2018. ^ "Hidden Masterpieces: Covered Bridges in PA". Pennsylvania Book Center. Spring 2010. Retrieved October 15, 2018. ^ "Throwback Thursday: Covered bridges". Canadian Geographic. May 28, 2015. Retrieved October 15, 2018. ^ "Visit America's Most Idyllic Covered Bridges". Architectural Digest. December 2016. Retrieved October 15, 2018. ^ Sapp, Mark E. (February 22, 2008). "Welding Timeline 1900–1950". WeldingHistory.org. Archived from the original on August 3, 2008. Retrieved April 29, 2008. ^ "Beam bridges". Design Technology. Archived from the original on May 18, 2008. Retrieved May 14, 2008. ^ Structural Beam Deflection Stress Bending Equations / Calculation Supported on Both Ends Uniform Loading Archived January 22, 2013, at Archive.today. Engineers Edge. Retrieved on April 23, 2013. ^ "A big prefabricated bridge". Life. 40 (22): 53–60. May 28, 1956. ^ "ASCE | Civil What? | Bridges". www.asceville.org. Archived from the original on February 3, 2017. Retrieved February 2, 2017. ^ Naito, Clay; Sause, Richard; Hodgson, Ian; Pessiki, Stephen; Macioce, Thomas (2010). "Forensic Examination of a Noncomposite Adjacent Precast Prestressed Concrete Box Beam Bridge". Journal of Bridge Engineering. 15 (4): 408–418. doi:10.1061/(ASCE)BE.1943-5592.0000110. ^ Gorazd Humar (September 2001). "World Famous Arch Bridges in Slovenia". In Charles Abdunur (ed.). Arch'01: troisième Conférence internationale sur les ponts en arc Paris: (in English and French). Paris: Presses des Ponts. pp. 121–124. ISBN 2-85978-347-4. Archived from the original on July 30, 2016. ^ "Longest bridge, steel arch bridge". Guinness World Records. Archived from the original on October 19, 2013. Retrieved February 18, 2013. ^ Sigmund, Pete (February 7, 2007). "The Mighty Mac: A Sublime Engineering Feat". Construction Equipment Guide. Archived from the original on April 5, 2013. Retrieved May 14, 2008. ^ Johnson, Andy. "Cable Stay vs Suspension Bridges". U.S. Department of Energy. Archived from the original on May 18, 2008. ^ Walther, René (1999). Cable Stayed Bridges. p. 7. ISBN 978-0-7277-2773-2. Archived from the original on November 15, 2016. ^ Poser, Marcel. "Cable Stayed Structures and Stay Cable Technology" (PDF). Archived from the original (PDF) on February 9, 2013. ^ Elder, Miriam (July 2, 2012). "Russian city of Vladivostok unveils record-breaking suspension bridge". The Guardian. London. Archived from the original on January 20, 2016. Retrieved February 3, 2016. ^ a b Žnidarič, Aleš; Pakrashi, Vikram; O'Brien, Eugene; O'Connor, Alan (December 2011). "A review of road structure data in six European countries". Proceedings of the Institution of Civil Engineers - Urban Design and Planning. 164 (4): 225–232. doi:10.1680/udap.900054. ISSN 1755-0793. ^ a b c O'Brien, Eugene J.; Keogh, Damien L.; O'Connor, Alan J. Bridge deck analysis (Second ed.). Boca Raton. ISBN 9781482227246. OCLC 892094185. 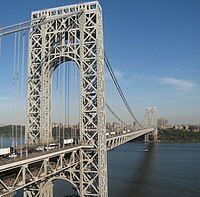 ^ a b "Port Authority of New York and New Jersey – George Washington Bridge". The Port Authority of New York and New Jersey. Archived from the original on September 20, 2013. Retrieved September 13, 2013. ^ a b Bod Woodruff; Lana Zak & Stephanie Wash (November 20, 2012). "GW Bridge Painters: Dangerous Job on Top of the World's Busiest Bridge". ABC News. Archived from the original on September 28, 2013. Retrieved September 13, 2013. ^ "The Mile-End Crossing". The Observer. LXXXI, (6, 004). South Australia. February 23, 1924. p. 16. Retrieved March 26, 2018 – via National Library of Australia. ^ Sarah Holder (July 31, 2018). "Animals Need Infrastructure Too". CityLab. Retrieved February 21, 2019. ^ Jessica Stewart (February 9, 2017). "Bridges for Animals to Safely Cross Freeways Are Popping Up Around the World". My Modern Met. Retrieved February 21, 2019. ^ Rachel Newer (July 23, 2012). "World's Coolest Animal Bridges". Smithsonian.com. Retrieved February 21, 2019. ^ Marsh, Julia (December 30, 2018). "Port Authority not liable for NYC bridge jumpers: judge". Retrieved January 3, 2019. ^ "How are Living Root Bridges Made?". The Living Root Bridge Project. May 5, 2017. Archived from the original on September 5, 2017. Retrieved September 8, 2017. ^ "The Vine Bridges of Iya Valley". Atlas Obscura. Archived from the original on September 8, 2017. Retrieved September 8, 2017. ^ "Cantilever". Bridges of Dublin. Archived from the original on October 29, 2014. ^ "Suspension Bridges". Made How. Archived from the original on January 2, 2015. ^ "Beam Bridges". PBS. Archived from the original on January 6, 2015. ^ K, Aggeliki; Stonecypher, Lamar (February 10, 2010). "Truss Bridge Designs". Bright Hub Engineering. Archived from the original on February 19, 2015. ^ O’Brien, E.J; Keogh, D.L (December 1998). "Upstand finite element analysis of slab bridges". Computers & Structures. 69 (6): 671–683. doi:10.1016/S0045-7949(98)00148-5. ^ Leonhardt, Fritz (1984). Bruc̈ken : Asthetik und Gestaltung [Bridges : aesthetics and design]. Cambridge, MA: MIT Press. ISBN 0262121050. OCLC 10821288. ^ a b OBrien, Eugene J.; Keogh, Damien L.; O'Connor, Alan (2015). Bridge deck analysis. CRC Press. ISBN 9781482227239. OCLC 897489682. ^ Enright, Bernard; O'Brien, Eugene J. (December 2013). "Monte Carlo simulation of extreme traffic loading on short and medium span bridges". Structure and Infrastructure Engineering. 9 (12): 1267–1282. doi:10.1080/15732479.2012.688753. ISSN 1573-2479. ^ Caprani, Colin C.; OBrien, Eugene J. (March 2010). "The use of predictive likelihood to estimate the distribution of extreme bridge traffic load effect". Structural Safety. 32 (2): 138–144. doi:10.1016/j.strusafe.2009.09.001. ^ OBrien, Eugene J.; Enright, Bernard (July 2011). "Modeling same-direction two-lane traffic for bridge loading". Structural Safety. 33 (4–5): 296–304. doi:10.1016/j.strusafe.2011.04.004. ^ OBrien, Eugene J.; Leahy, Cathal; Enright, Bernard; Caprani, Colin C. (September 30, 2016). "Validation of scenario modelling for bridge loading". The Baltic Journal of Road and Bridge Engineering. 11 (3): 233–241. doi:10.3846/bjrbe.2016.27. ISSN 1822-427X. ^ OBrien, E.J. ; Bordallo-Ruiz, A.; Enright, B. (September 2014). "Lifetime maximum load effects on short-span bridges subject to growing traffic volumes". Structural Safety. 50: 113–122. doi:10.1016/j.strusafe.2014.05.005. ^ Enright, Bernard; OBrien, Eugene J.; Leahy, Cathal (December 2016). "Identifying and modelling permit trucks for bridge loading". Proceedings of the Institution of Civil Engineers - Bridge Engineering. 169 (4): 235–244. doi:10.1680/bren.14.00031. ISSN 1478-4637. ^ CivilEngineeringTutor, Author: (August 17, 2016). "HL-93 AASHTO Vehicular Live Loading | Truck | Tandem | Design Lane Load". EngineeringCivil.org. Retrieved March 15, 2019. ^ Leahy, Cathal; OBrien, Eugene J.; Enright, Bernard; Hajializadeh, Donya (October 2015). "Review of HL-93 Bridge Traffic Load Model Using an Extensive WIM Database". Journal of Bridge Engineering. 20 (10): 04014115. doi:10.1061/(ASCE)BE.1943-5592.0000729. ISSN 1084-0702. ^ a b "EN 1991-2:2003". www.wikidata.org. Retrieved March 14, 2019. ^ O'Connor, Alan; Jacob, Bernard; O'Brien, Eugène; Prat, Michel (June 2001). "Report of Current Studies Performed on Normal Load Model of EC1: Part 2. Traffic Loads on Bridges". Revue Française de Génie Civil. 5 (4): 411–433. doi:10.1080/12795119.2001.9692315. ISSN 1279-5119. ^ A.S, Nowak; M, Lutomirska; F.I, Sheikh Ibrahim (2010). "The development of live load for long span bridges". Bridge Structures (1, 2): 73–79. doi:10.3233/BRS-2010-006. ISSN 1573-2487. ^ Micu, Elena Alexandra; Obrien, Eugene John; Malekjafarian, Abdollah; Quilligan, Michael (December 21, 2018). "Estimation of Extreme Load Effects on Long-Span Bridges Using Traffic Image Data". The Baltic Journal of Road and Bridge Engineering. 13 (4): 429–446. doi:10.7250/bjrbe.2018-13.427. ISSN 1822-4288. ^ OBrien, E. J.; Hayrapetova, A.; Walsh, C. (March 2012). "The use of micro-simulation for congested traffic load modeling of medium- and long-span bridges". Structure and Infrastructure Engineering. 8 (3): 269–276. doi:10.1080/15732471003640477. ISSN 1573-2479. ^ Caprani, Colin C.; OBrien, Eugene J.; Lipari, Alessandro (May 2016). "Long-span bridge traffic loading based on multi-lane traffic micro-simulation". Engineering Structures. 115: 207–219. doi:10.1016/j.engstruct.2016.01.045. ^ OBrien, Eugene J.; Lipari, Alessandro; Caprani, Colin C. (July 2015). "Micro-simulation of single-lane traffic to identify critical loading conditions for long-span bridges". Engineering Structures. 94: 137–148. doi:10.1016/j.engstruct.2015.02.019. ^ Dawe, Peter (2003). Research perspectives : traffic loading on highway bridges. London: Thomas Telford. ISBN 0727732412. OCLC 53389159. ^ Fryba, L. (2009). Dynamics of railway bridges. Thomas Telford. ISBN 9780727739568. OCLC 608572498. ^ Li, Yingyan; OBrien, Eugene; González, Arturo (May 2006). "The development of a dynamic amplification estimator for bridges with good road profiles". Journal of Sound and Vibration. 293 (1–2): 125–137. doi:10.1016/j.jsv.2005.09.015. ^ Cantero, D.; González, A.; OBrien, E. J. (June 2009). "Maximum dynamic stress on bridges traversed by moving loads". Proceedings of the Institution of Civil Engineers - Bridge Engineering. 162 (2): 75–85. doi:10.1680/bren.2009.162.2.75. ISSN 1478-4637. ^ Cantero, D; O'Brien, E J; González, A (June 2010). "Modelling the vehicle in vehicle—infrastructure dynamic interaction studies". Proceedings of the Institution of Mechanical Engineers, Part K: Journal of Multi-body Dynamics. 224 (2): 243–248. doi:10.1243/14644193JMBD228. ISSN 1464-4193. ^ González, A.; Cantero, D.; OBrien, E.J. (December 2011). "Dynamic increment for shear force due to heavy vehicles crossing a highway bridge". Computers & Structures. 89 (23–24): 2261–2272. doi:10.1016/j.compstruc.2011.08.009. ^ González, Arturo; OBrien, Eugene J.; Cantero, Daniel; Li, Yingyan; Dowling, Jason; Žnidarič, Ales (May 2010). "Critical speed for the dynamics of truck events on bridges with a smooth road surface". Journal of Sound and Vibration. 329 (11): 2127–2146. doi:10.1016/j.jsv.2010.01.002. ^ Brady Sean P.; O'Brien Eugene J.; Žnidarič Aleš (March 1, 2006). "Effect of Vehicle Velocity on the Dynamic Amplification of a Vehicle Crossing a Simply Supported Bridge". Journal of Bridge Engineering. 11 (2): 241–249. doi:10.1061/(ASCE)1084-0702(2006)11:2(241). ^ OBrien, Eugene J.; Cantero, Daniel; Enright, Bernard; González, Arturo (December 2010). "Characteristic Dynamic Increment for extreme traffic loading events on short and medium span highway bridges". Engineering Structures. 32 (12): 3827–3835. doi:10.1016/j.engstruct.2010.08.018. ^ "The new Minnesota smart bridge" (PDF). mnme.com. Archived (PDF) from the original on August 23, 2012. Retrieved January 30, 2012. ^ "Basic Principles of Vibrometry". polytec.com. Archived from the original on June 10, 2012. Retrieved January 25, 2012. ^ Yang, Y.-B. ; Lin, C.W. ; Yau, J.D. (May 2004). "Extracting bridge frequencies from the dynamic response of a passing vehicle". Journal of Sound and Vibration. 272 (3–5): 471–493. doi:10.1016/S0022-460X(03)00378-X. ^ Yang, Y. B.; Yang, Judy P. (February 2018). "State-of-the-Art Review on Modal Identification and Damage Detection of Bridges by Moving Test Vehicles". International Journal of Structural Stability and Dynamics. 18 (02): 1850025. doi:10.1142/S0219455418500256. ISSN 0219-4554. ^ Malekjafarian, Abdollah; McGetrick, Patrick J.; OBrien, Eugene J. (2015). "A Review of Indirect Bridge Monitoring Using Passing Vehicles". Shock and Vibration. 2015: 1–16. doi:10.1155/2015/286139. ISSN 1070-9622. ^ OBrien, E. J.; Keenahan, J. (May 2015). "Drive-by damage detection in bridges using the apparent profile: DRIVE-BY DAMAGE DETECTION IN BRIDGES USING THE APPARENT PROFILE". Structural Control and Health Monitoring. 22 (5): 813–825. doi:10.1002/stc.1721. ^ Malekjafarian, Abdollah; Martinez, Daniel; OBrien, Eugene J. (2018). "The Feasibility of Using Laser Doppler Vibrometer Measurements from a Passing Vehicle for Bridge Damage Detection". Shock and Vibration. 2018: 1–10. doi:10.1155/2018/9385171. ISSN 1070-9622. Brown, David J. Bridges: Three Thousand Years of Defying Nature. Richmond Hill, Ont: Firefly Books, 2005. ISBN 1-55407-099-6. Sandak, Cass R. Bridges. An Easy-read modern wonders book. New York: F. Watts, 1983. ISBN 0-531-04624-9. Structurae – International Database and Gallery of Engineerings Structures with over 10000 Bridges. This page was last edited on 12 April 2019, at 07:50 (UTC).